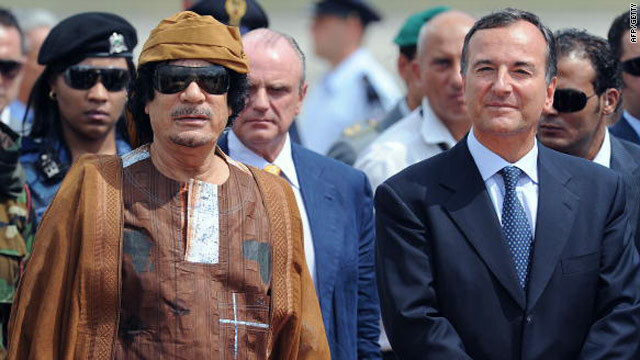 Libya's leader Moammar Gadhafi (left) next to Italy's foreign minister Franco Frattini August 29 at Ciampino airport, Italy. (CNN) -- Libyan leader Moammar Gadhafi arrived in Italy Sunday, a year after his historic trip there to mark closer ties between the two countries. He was greeted by Italian Foreign Minister Franco Frattini. He arrived at Rome's Ciampino Airport and waved to reporters as he walked by. He is expected to depart Tuesday. Libya and Italy signed a pact in August 2008 that normalized relations and closed the painful chapter of Italian colonization in Libya. The pact was signed in Libya, and last year, Gadhafi made his first visit to Rome to mark its anniversary. This year's anniversary will be marked with an equestrian show, for which Libya is sending 30 horses and riders. Italian Carabinieri, or military police, will also take part in the show with their own horses. A gala dinner with about 800 guests is planned for after the show, according to the Italian government press office. Gadhafi is also expected to inaugurate a Libyan academy in Rome. Like he often does on foreign visits, Gadhafi will stay in a traditional Bedouin tent while in Rome, which was set up for him at the Libyan Embassy residence. Last year, he set up the tent in one of Rome's most beautiful central parks, Villa Pamphili.